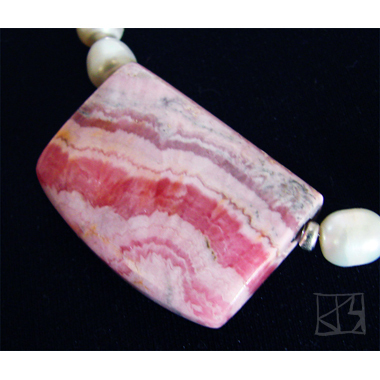 The finest deposits of rhodochrosite are found in the Argentine, where the Incas believed it to be the preserved blood of their ancestors. Occurring as stalactites in silver mines -- sometimes containing layers of silver and/or bursts of pyrite -- this treasure was once discarded by miners in slag heaps! It is said to be related to the heart chakra, stimulating beat and blood flow both physically and metaphorically, opening the heart to warmth, love, compassion. It inspires confidence and heals one's sense of despair, encouraging to renewed life, hope and acceptance. All this and beautiful, too! 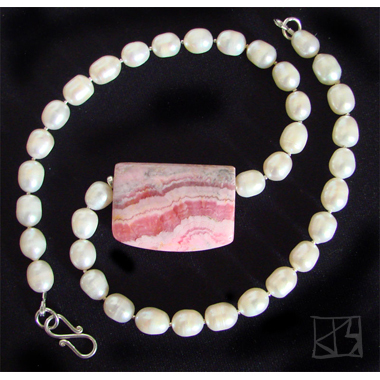 Hand-cut and polished rhodochrosite is the center of attention on this full strand of luminous natural pearls separated by tiny sterling beads. A silver s-hook closes this piece securely in the back. Elegant for evening, a statement at the office, the perfect accessory to elevate your casual everyday wardrobe.